Origin and Habitat: Delonix elata has a widespread distribution and is found naturally between 25 degrees north to 8 degrees south. Native countries Djibouti, Egypt, Ethiopia, Kenya, Saudi Arabia, Somalia, Sudan, Tanzania, United Republic of, Uganda, and Yemen. Introduced in Cambodia, Maldives, Myanmar, Namibia, Nigeria, Oman, Pakistan, and Sri Lanka. Present, but origin uncertain in India and Zambia. (Totatal estimated area of occupancy km2 7384920). Also widely cultivated as an avenue tree and for shade elsewhere in the tropics. Altitude:: In is native range this species is mainly found from 100 to 1400 metres above sea level, but recorded from sea level up to 2,000 m and occasionally as high as 4,000 metres. Habitat and Ecology: This species is found growing in hot, dry Acacia-Commiphora bushland or thicket vegetation with Abrus schimperi, Acacia brevispica, Acacia millitera, Acacia nigrescens, Acacia pennata, Acacia tortilis, Anogeissus bentii, Boscia arabica, Combretum, Commiphora, Ehretia coerulea, Euphorbia cunexta, Euphorbia nubica, Ficus salicifolia, Thylachium africanum, Ziziphus mucronata, and Ziziphus spina-christi. It normally occurs on rocky, shallow, red soils, and is capable of growing on poor soil. It is susceptible to waterlogging. Mean annual temperature 27 deg C. Mean annual rainfall 580-900 mm. 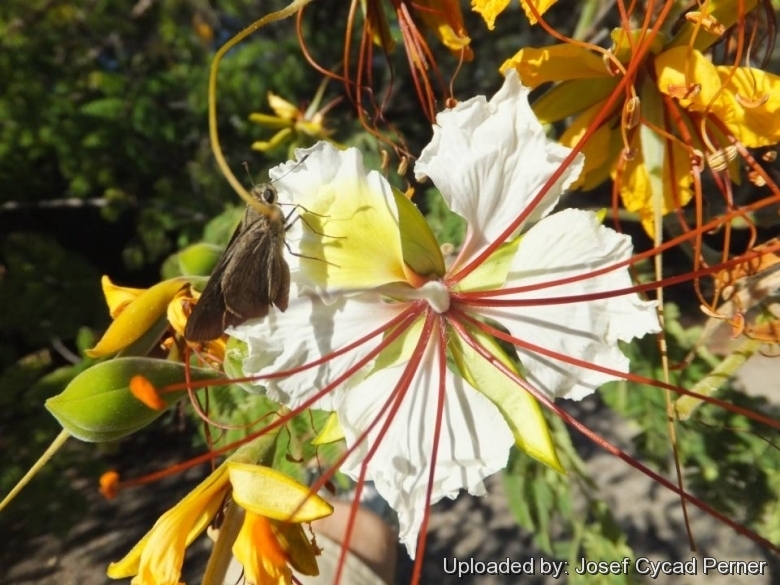 Delonix elata is Found in such a wide range of habitats and geographical areas, that although there may be localized threats to parts of the population, no threat has been identified to affect the entire population. Description: Delonix elata is a perennial, medium-sized, deciduous tree about 2.5-15 m tall, with a spreading, rather rounded crown and very attractive, white fragrant flowers. Delonix elata is a variable species showing correlation with geography, variations mostly regarding number of pinnae pairs per leaf, and density of pubescence in the inflorescence (including the outside of the calyces). There are, however, good reasons for not recognizing these local or morphological forms as subspecies or varieties. 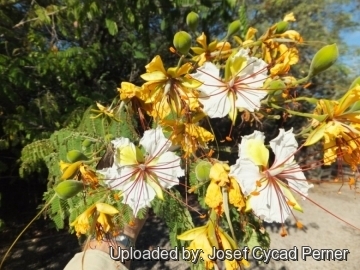 This tree is a close relative of popular Delonix regia and has similar growth habit and characteristics, but differs from the latter in having small subulate deciduous stipules; white, yellow or orange petals which are only 1,6-3,8 cm long; stamen-filaments which exceed the petals; and smaller pods, 13-26 cm long, 2,1-3,7 cm wide. Derivation of specific name: The epithet “elata” means lofty or tall. Stem: Trunk erect, crooked with drooping branches. Bark rather smooth, ash-coloured, shining, sometimes flaking. Leaves: 6-20 cm long, bipinnate, paripinate with small deciduous subulate stipules. Rachis 9-18 cm in length, distal end prolonged, base pulvinus. Pinnae usually 4-6 pairs, but varying from 2 to 12 pairs, opposite, 5-7 cm in length, a gland is seen at the base of the sub-rachis. Leaflets (8–)10-15(-25) pairs, sessile or subsessile, linear-oblong or oblanceolate-oblong, obtuse, sometimes slightly mucronate, narrowed towards the base, (4-)6-12(-17) mm long, 1.5-5 mm in breadth, usually rounded at apex, appressed-puberulous on both surfaces, smaller than those of Delonix regia. Petiolule sub sessile, veins are not prominent. Colour pale green on upper side and yellow green on lower side, taste astringent and odour is not characteristic. Inflorescences: Terminal racemes, 5–20-flowered (or more). Stalks pubescent (including the calyces outside), lowest flowers pedicel longest. Bracts small, deciduous before flowers open. Flowers: Hermaphroditic. Calyx 2-3 cm long, fused at the base, leathery, silky pubescent, oblong, narrow and sharp pointed. Sepals 1.8 cm long, with a broadly ovate or rotundate-cuneate lamina narrowing into a distinct claw. Corolla white in the beginning, turning yellow, petals rounded in outline and crisped on margins 16-38 mm long, 18-42 mm wide; upper one smaller than rest, pale yellow; the remainder white; later all turning apricot. Staminal filaments pale brown or reddish, hairy at the base, (3-)5-10(-11) cm long, thickened at the base. Pedicels up to 3.75 cm. Ovary pubescent or tomentose all over outside. Fruits (legumes): Red-brown or purple-brown, 13-25 cm long and 2.1–3.7 cm wide, smooth, compressed elliptic-oblong, narrow at both the ends. Seeds: 4-8 oblong-elliptic, flattened, 12-15 mm long, 5–8 mm wide, mottled. Phenology: Delonix elata flowers in the hot season or during the early rains, in east Africa this is normally around December and August-March in India. Flowers open one at a time. Fruit ripening is between May and July. 3) M. Thulin “Flora Somalia”, 1993. 9) Wikipedia contributors. "Delonix elata" Wikipedia, The Free Encyclopedia. Wikipedia, The Free Encyclopedia, 7 June 2015. Web. 16 September 2015. 11) Bajrang Singh, Khanduja SD and Srivastava GS. "Qualitative analysis of some firewood shrubs." Biomass. 5(4): 12) 317-320. 1984. 13) Blatter E and Millard SW. “Some beautiful Indian trees.” 2nd Ed. Bombay Natural History Society. Bombay, India.1954. 14) Brenan JPM. “Leguminosae (I) subfamily Caesalpinioideae”. In: Flora of Tropical East Africa. Crown Agents, London.1959. 15) Eggeling. “Indigenous trees of Uganda. Govt. of Uganda.” 1940. 16) Rokhade AK and Nalawadi UG. 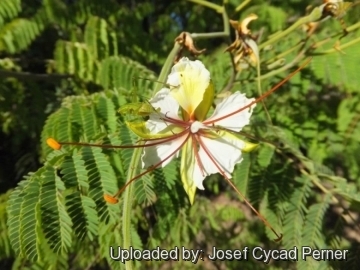 “Improving germination of Poinciana elata seeds.” South Indian Horticulture. 37(6): 359-360.1989. 17) Sethuraman MG and Sasikumar G. “Constituents of Delonix elata roots.” Fitoterapia. 66(1): 1995. 18) Rivers, M. 2014. Delonix elata. The IUCN Red List of Threatened Species 2014: e.T201497A2707261. http://dx.doi.org/10.2305/IUCN.UK.2014-1.RLTS.T201497A2707261.en . Downloaded on 16 September 2015. Cultivation and Propagation: Delonix elata is a fast growing tree raised easily from seed. It grows in any rich, very well drained, soil with some water and lots of sun throughout the year. It is suited to greenhouse culture but does well out of doors in tropical and mild Mediterranean climates. Exposure: It requires high light, so it is planted in full sunlight, but tolerates light shade. Hardiness: Keep at a minimum winter temperature of about 12°C (Mature plants are tender and hardy only to 2° C for a short period; avoid in any case freezing temperatures). Watering: Water plentifully in summer but keep rather dry in winter. It doesn't like wet winter but will survive. Garden uses: D. elata is a distinct, magnificent tree in bloom, suitable for cultivation in gardens, avenues and amenity parks, grown as a shade tree or to provide shelter, etc..
Medicine uses: The leaf extracts are anti-inflammatory, a root decoction is drunk for abdominal pains. A pychosomatic medicinal use relating to scorpion bite treatment is reported from India. Other uses:* This species is used as fodder for goats, sheep, camels and cattle which eat the foliage and young pods, and often plants are heavily grazed by them. The wood after seasoning, is yellow, even-grained and easily worked. It is suitable for cabinet work, carvings and utensils, for tooth brushes, walking sticks and arrows, and is also a good firewood source. The tree yields a dark coloured, mucilaginous gum. It is also planted as fence posts, has potential use in soil conservation, and is a good tree for reforestation of difficult sites. Propagation: Propagate usually from seed that are very easy to germinate. Seeds need up to 1 month to germinate. Minimum 30°C. Maximum 42°C. Before sowing put the seeds in hot boiling water and the seed starts to peel, don't worry and put them in pots they will start germinating in the following week, just ensure that they grow straight, they have the tendency to fall down. Browsers are used to protect the young seedlings.